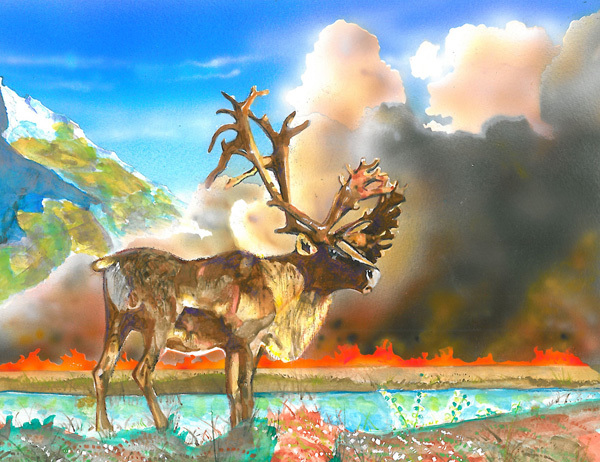 Sky Waters, an 11-year-old fifth-grader from Eagan, has won the 2012 Endangered Species Day Youth Art Contest with his depiction of a woodland caribou. Sky will be going to Washington, D.C., next month for a reception and will have his name engraved on a special trophy. He’ll also get an art lesson from the artist Wyland, and will receive a plaque and art supplies. The contest is sponsored by the U.S. Fish and Wildlife Service, Endangered Species Coalition, Association of Zoos and Aquariums and Ogden Museum of Southern Art/University of New Orleans. The winners were chosen by a panel of artists, photographers, scientists and conservationists, including Wyland, the marine artist; Jack Hanna, host of Jack Hanna’s Into the Wild; David Littschwager, a freelance photographer and regular contributor to National Geographic Magazine; Susan Middletown, a photographer who has collaborated with Littschwager and whose own work has been published in four books; and Tom Sachs, whose work can be found in major museums worldwide. “It is incredible to see children’s innate love of animals paired with their uninhibited artistic talent producing such inspiring works of art,” Leda Huta, executive director of the Endangered Species Coalition, said in a release. Forty semifinalists were chosen by the Ogden Museum of Southern Art/University of New Orleans, which will display the artwork in a special exhibit opening June14. “We reviewed such a variety of excellent entries from talented young artists from throughout the country; it was difficult to choose even the semifinalists,” stated Ellen Balkin, Education Coordinator at the Ogden Museum. Semifinalists will receive a Certificate of Achievement. Started in 2006 by the United States Senate, Endangered Species Day is a celebration of our nation’s imperiled plants and wildlife and wild places, with an emphasis on success stories of species recovery. To see the winning artwork, visit http://stopextinction.org/media/ESDArt.html. For more information about the art contest, winners and Endangered Species Day, visit www.EndangeredSpeciesDay.org. To learn more about the Endangered Species Program, visit: http://www.fws.gov/endangered/.